The much-awaited Google Pixel 3 event is just around the corner. 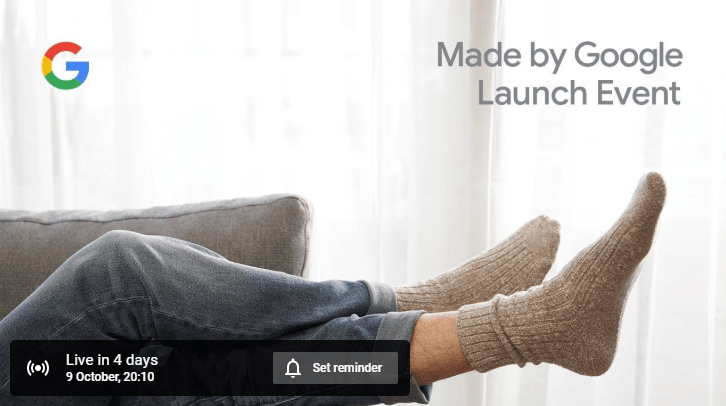 Google has a bunch of products to announce at the event. We have already seen many of them in the rumor mill. The Google Pixel 3 event will be held in New York City on Tuesday, October 9th. Before looking at the products we should expect at the show, let’s first look at the start time and how you can watch it live right from the comfort of your home or office. The event is scheduled to begin at 11 AM Eastern Time on Oct.9. That’s 8 AM Pacific Time and 3 PM GMT. The search engine giant will also hold concurrent events in London, Paris, and Japan. Just like previous Pixel events, Google will livestream this one for its fans around the world. You can watch the live streaming on the Made by Google YouTube channel. You can go directly to the event video page and sign up for a reminder when the event kicks off. Google has done a terrible job keeping its upcoming smartphones under the wraps. The Pixel 3 and Pixel 3 XL were selling in the black market in Ukraine several weeks before the search engine even announced the Google Pixel 3 event. People who purchased the devices have revealed almost everything about them. The new Pixel phones will bring a lot of upgrades. Both the Pixel 3 and Pixel 3 XL will be identical in terms of specs, though the external design will be different. The Pixel 3 would look like last year’s Pixel 2 XL with bezels at the top and bottom. In contrast, the Pixel 3 XL will have a larger size, a bottom chin, and a display notch at the top. The rear panel on both handsets will be made out of glass to enable wireless charging. The upcoming Pixel phones will have a Pixel Imprint fingerprint sensor on the back, a squeezable frame and upgraded cameras. The devices will keep only a single camera lens on the back, though they could get dual cameras on the front. In terms of specs, both the handsets would feature 4GB RAM, Snapdragon 845 chipset, 64GB base storage, and Android 9 Pie software. Google’s AI features will be deeply integrated into every aspect of the phones. Last year, Google tried to imitate Apple by ditching the 3.5mm headphone jack on Pixel devices and introducing wireless earphones called Pixel Buds. The only problem was that the Pixel Buds were horrible at best. The company is expected to launch an improved Pixel Buds 2 at the next week’s Google Pixel 3 event. Google has to catch up not only with Apple’s AirPods but also with a bunch of affordable wireless earbuds available in the market. The smart speakers are no longer just speakers. They are acquiring new capabilities. Amazon’s upgraded Alexa and Echo Show have a touchscreen display, so do many other smart speakers. According to the rumor mill, Google is also preparing to launch a new Home speaker with a smart display. Folks at 9to5Google claim it could be called Google Home Hub. The Google Home Hub would have a 7-inch display mounted on a speaker base. Leaked official press renders suggest it will be available in both black and white color options. It doesn’t have a camera, which means it won’t support video calling. The Home Hub would give you updates and verbal feedback on weather, traffic, and other information. As per a retail listing, it will be priced at $149. The new Chromecast first leaked in the FCC documents back in April. As if that wasn’t enough, Best Buy recently sold the new Chromecast to a customer even before the streaming stick was listed in the store’s system. The Chromecast 3 would run the quad-core Amlogic S05X chip. It would offer 2GB RAM, 8GB storage, and the ability to stream 4K content at 60fps. It would cost the same $35 as the current Chromecast. Google has been developing the Pixel Slate under the code-name ‘Nocturne.’ It will be a tablet running Chrome OS to challenge the iPad Pro and Microsoft’s Surface Pro. The Pixel Slate was leaked by accessories maker Brydge, which was designing a keyboard for Google’s upcoming tablet/convertible device. The leak indicated that it would have a slim form factor with a fingerprint reader on the top left corner. It would also have a USB-C port. At least one variant of the Pixel Slate would feature 16GB RAM and Intel Core i7-8500Y processor. It will have cameras on the front as well as back. Apple announced the AirPower wireless charging mat more than a year ago and it is still nowhere to be seen. 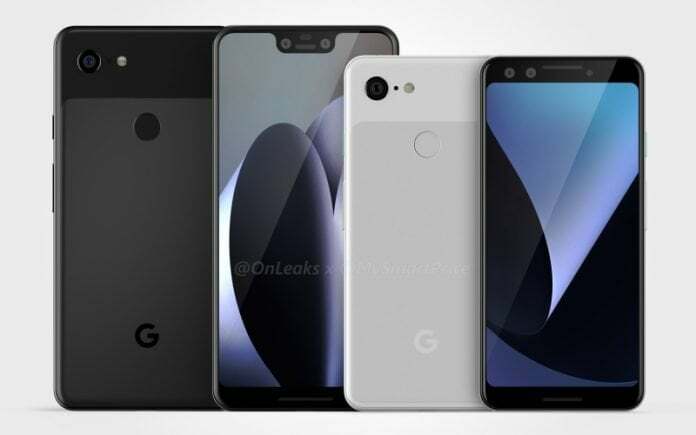 According to press renders shared by MySmartPrice, Google is preparing to launch a Pixel Stand at the Google Pixel 3 event. It will not only charge the Pixel phones wirelessly but also offer Google Assistant functions when the phone is docked. At the bottom, the Pixel Stand would have a USB-C port. It has also appeared in the FCC’s database, which indicated that the Pixel Stand would offer fast wireless charging. Among other things, we expect Google to unveil a new Pixelbook 2 at the event, which has been in development under the code-name ‘Atlas.’ Its exterior design would be similar to last year’s Pixelbook, though it will get internal upgrades. The upcoming Pixelbook 2 is expected to have a 4K display. A Google executive has confirmed that the company won’t release a smartwatch this year, meaning the so-called Pixel Watch will not be seen at the event.